We've got great news for those awaiting our New FamilySearch integration tools. We've now completed the requirements for "Sync Certification" and have applied for official certification on these features. Legacy is already certified in "Access", "Print", and "Ordinance Status". The certification process usually takes a few weeks. Once it passes FamilySearch's tests, we will undergo some further testing, and then announce the free update via this blog/website. To learn more about the FamilySearch integration tools, click here. The latest information from FamilySearch is that access to the new.familysearch.org website, to which Legacy's FamilySearch tools provide access, is still restricted to LDS members while the site is still undergoing development and testing. I hear that later this year, and possibly even the beginning of next year, it will be ready and available to the general public. When these parents were typed into Legacy, they were entered without a birth or christening date, and without any death or burial information. Consequently, their Living Status was left as "Living". Normally, a person's living status is set when you type a new person's information. The process is automatic if their death or burial information is entered, or if their birth or christening date is more than 120 years ago. If no birth, christening, death, or burial information is entered, their status remains at the default Yes, if not changed to No. Then, when I created this report, I turned on the option to "Suppress details for living people" and to "Change their name to 'Living'". This pedigree chart was displayed according to the options that I set. It is an easy task to set the Living Status of a few individuals manually if you need to, but you may already have hundreds of individuals in your Legacy family file whose living status is marked as "yes" even though they lived hundreds of years ago. This is where the "Advanced Set Living" feature comes in handy. This tool does an intelligent search through your entire family file looking for people that are older than the cutoff age, which is usually 120 years old. (This 120-year-parameter can be adjusted at Options > Customize > Data Entry tab > Presumed Dead section.) When someone of this age is found, it is assumed that all of their ancestors are older than that and that they are all dead. Legacy then sets their Living status to No as far back as the line goes from there, regardless of whether or not they have birth or christening dates. Do you see now why the programmers wanted to call this feature Intelli-Murder? Go to Tools > Advanced Set Living. Set the cutoff age at the desired level by either typing in the number or by using the up and down arrows. Click Start. Legacy goes through your entire family file setting the Living status to No when it is determined that they are older than the age you specified. When finished, Legacy asks if you would like to see a list of all the people who had their Living status changed to No. You might be surprised by all the people you "killed" off. So now it is your turn. Use this feature and then report back to us using the comments section below. A new Legacy Family Tree user group has recently formed in Des Moines, Iowa. In April I spoke to these people and they are serious about genealogy! The group meets the third Thursday of the month at the Iowa Genealogical Society Library (628 E. Grand) in Des Moines from 1-3pm. An added bonus is that the IGS Library is open on Thursdays from 10am-9pm. The group is open to the public - all are invited to attend. Contact Carlita Beltz for more information. Click here for an updated directory of Legacy user groups throughout the world. There are now 36 such "official" groups. Send me an email if you are interested in forming a group in your area. FamilySearch is sending you a new monthly FamilySearch indexing newsletter to keep you informed and connected to new program developments. This monthly update will also include tips and suggestions for improving your skills and personal stories about how indexing is making a difference for those who seek information about their ancestors as well as those who participate in the program. This inaugural edition of a monthly newsletter demonstrates an increasing desire to better communicate with the volunteers who participate in this wonderful cause of providing access to the world s records online. Each monthly edition will strive to provide you with valuable information and inspiration to improve your indexing experience. Although newsletters are typically a one-way form of communication, we want to include voices from as many people in the community as possible. We invite you to share your ideas for interesting articles or success stories to help this newsletter reflect the voice of this wonderful program. Your suggestions will help us recognize those topics that are most helpful and interesting to you. Please send your ideas to fsindexing@familysearch.org. Please be aware that you can also unsubscribe from this newsletter at any time by following the instructions provided at the end of the newsletter. Thank you for your ongoing participation in indexing. We look forward to better serving your needs through improved communication. Thanks to the past efforts of indexing volunteers like you, more than 150 new collections were made available to FamilySearch patrons within the last month. FamilySearch volunteers indexed over 120 million records over 300 million new names from original source documents to provide others with access to these records. The massive release was announced at the National Genealogical Society annual conference in Salt Lake City, Utah. The records can be found at FamilySearch's Record Search pilot (on FamilySearch.org, click Search Records, and then click Record Search pilot) or go to Beta.FamilySearch.org. Be sure to share the good news with family and friends. FamilySearch indexing is grateful for your ongoing patience and support as we continue to improve our system and processes. Unfortunately, progress sometimes creates some disruption along the way. That was the case in March when Indexing was tied to the new unified FamilySearch account system. While the transition and process has been difficult for many, the number of successful account creations and account mergers is encouraging. If you haven't had a chance to move to the unified FamilySearch account system that was launched on March 18, please take a moment to read the original announcement and instructions. If you are still having issues creating your account or signing in to the indexing system, please review our list of common issues. You are among the first FamilySearch patrons to take advantage of our new unified accounts system and enjoy the convenience of just one registration (either a FamilySearch or LDS account) for several Web sites including the FamilySearch Research Wiki, new FamilySearch, FamilySearch Beta, and stake and ward Web sites with more to come. The indexing you perform makes a difference to hundreds of thousands of people each month who find their ancestors and the records that document their lives from the images we have indexed on their behalf. A page with the latest status on indexing projects is now available online at the FamilySearch Wiki. This page is updated frequently, so you may want to bookmark the page for future reference. This page will let you know when projects are nearing completion or available online. It will also introduce you to new indexing projects as they come online. Your indexing efforts continue to make a difference to people around the world who are seeking information about their ancestors online. Thanks again for your ongoing participation and support! Do some more indexing today. In July and August we will participate in events in Missouri, Oregon, Tennessee, Texas, and Utah. Other Legacy groups will meet in locations throughout the world. We hope to see you soon! USA | Utah | Provo - July 11. The BYU Family History Library will teach an overview to Legacy class (for intermediate to advanced users). Professional genealogist, historian, and retired Special Collections librarian, Haybron Adams, will teach the class. Held at the Harold B. Lee Library on BYU's campus, the class begins at 4:30pm. For more information, click here. USA | Texas | Austin - July 17. Austin Genealogical Society presents a Genealogy Technology seminar by Legacy's Geoff Rasmussen. Held at Highland Park Baptist Church, 5206 Balcones Drive in Austin from 9am-1pm. Classes include Genealogist's Guide to Working with Digital Images, Timelines & Chronologies: Secrets of Genealogical Success, 12-Step Checklist to Using Your Genealogy Computer Program, Overview of Legacy Family Tree. Visit http://www.austintxgensoc.org for more information. USA | Utah | St. George - July 21-23. St. George Regional Family History Training Center located across the street from the St. George LDS temple. This is a 3-session Legacy class of two hours each day. 10:30am-1:00pm. In addition to the demonstration of how to use Legacy, students will also have hands-on practice along with assignments and handouts to best learn the software. Registration is limited, but is open to anyone. Contact David Midgley for more information or call 435-673-4591. USA | Utah | Provo - July 27-30. 42nd annual BYU Conference on Family History and Genealogy. Click here for more information. We will teach two classes which are open to the public: Tuesday, July 27, 5:10pm - Legacy and New FamilySearch and Wednesday, July 28, 5:10pm - Overview of Legacy Family Tree. USA | Oregon | Tualatin - July 29. The Tualatin LDS Stake is hosting a genealogy seminar featuring Legacy's Geoff Rasmussen. Held at the LDS building at 22284 SW Grahams Ferry Rd in Tualatin from 6:00-9:00pm. For more information, please email Geoff. Classes will include: 1) Timelines and Mapping: Secrets of Genealogical Success Using the Latest Software and Internet Sites, 2) Organizing, Planning, Mapping, Sourcing, Charting, and Sharing with Legacy Family Tree, 3) New FamilySearch Cleanup Strategies. The classes are free and open to the public - no registration required. USA | Missouri | Kansas City - July 30-31. Midwest Family History Expo. Held at the KCI Expo Center (11730 N Ambassador Dr in Kansas City), come visit our Legacy booths for special seminar pricing on Legacy products and meet Legacy's Sarah Wood. 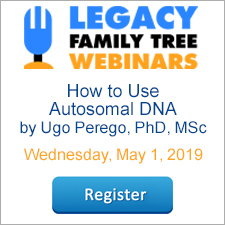 We will also teach two classes on using Legacy: "Organize, Plan, Share, Map, and Chart your family tree with Legacy Family Tree" and "Getting More from Legacy Family Tree". Char Mitts, professional genealogist and president of the Heartland Chapter of the Association of Professional Genealogists will be the speaker. Click here for more information. USA | Oregon | Eugene - July 31. Genealogical Council of Oregon Conference, "Summer Genealogy Fest" - featuring Elizabeth Shown Mills. 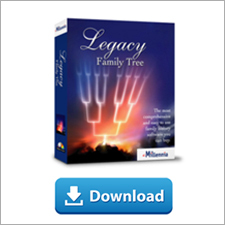 We will have a Legacy Family Tree booth. Legacy's Geoff Rasmussen will also teach: "Mapping Your Ancestors: the latest software and websites", and "Organizing, Planning, Sourcing, Mapping, and Sharing with Legacy Family Tree." Click here for more information. USA | Tennessee | Knoxville - August 18-21. Federation of Genealogical Societies (FGS) 2010 Conference. Click here for more information. USA | Utah | St. George - August 18-20. St. George Regional Family History Training Center located across the street from the St. George LDS temple. This is a 3-session Legacy class of two hours each day. 10:30am-1:00pm. In addition to the demonstration of how to use Legacy, students will also have hands-on practice along with assignments and handouts to best learn the software. Registration is limited, but is open to anyone. Contact David Midgley for more information or call 435-673-4591. USA | Utah | Sandy - Salt Lake Family History Expo. Held at the South Towne Exposition Center at 9575 S. State Street in Sandy. Visit us in booths 100 and 102. Beau Sharbrough will be teaching two classes on using Legacy. We will also teach a class on "Legacy and New FamilySearch". For more information, please click here.